We Dragon Age fans are still just clutching their mabari war hound toys and waiting for news of a Dragon Age 4, but one of the series' beloved characters, Varric, has been using the time off more productively. Yes, the fictional dwarf from Dragon Age 2 and Inquisition is publishing his novel, Hard in Hightown, later this year. 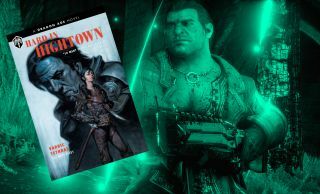 Publisher Dark Horse Books says "prolific dwarven author and heroic companion of the Dragon Age games, Varric Tethras brings us the collected edition of his breakthrough crime-noir drama, Hard in Hightown." Varric had a little help finishing his latest book thanks to author Mary Kirby, a writer at BioWare Edmonton. "What's this lead you have for me?" Donnen broke the silence, acutely aware that he stank of sweat and fish from the docks and was wearing a ripped, bloodstained coat in the most high-class café in Kirkwall. "We're being followed, guardsman." The lady's voice was low; from the tone, she might have been discussing the weather. "The two gentlemen in the corner by the door." Superfans may well have already read the whole thing through the game's codex entries, but this version will have illustrations from Stefano Martino, Álvaro Sarraseca, Andres Ponce, and Ricardo German Ponce Torres, as well as being an actual book that will look nice on your castle coffee table. Now we just need Morrigan to write her memoirs.